Grasshoppers are amazing little insects, and part of what makes them so remarkable is their ability to transform in an instant. 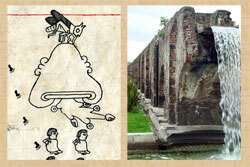 The Aztec were well aware of this ability, and, in some ways, this made the bugs a perfect fit in Aztec cosmology. 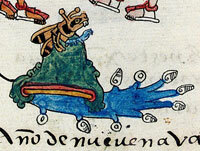 The hillsides surrounding the watery capital of Tenochtitlan were quite literally crawling with grasshoppers, particularly during the rainy season (summer) when they began to mate. In locations such as Chapultepec (Grasshopper Hill), male grasshoppers rubbed their legs against their wings and made a chirping sound that resonated throughout central Mexico. Once impregnated, the female laid dozens of eggs that hatched during the onset of the warmer, rainy weather. 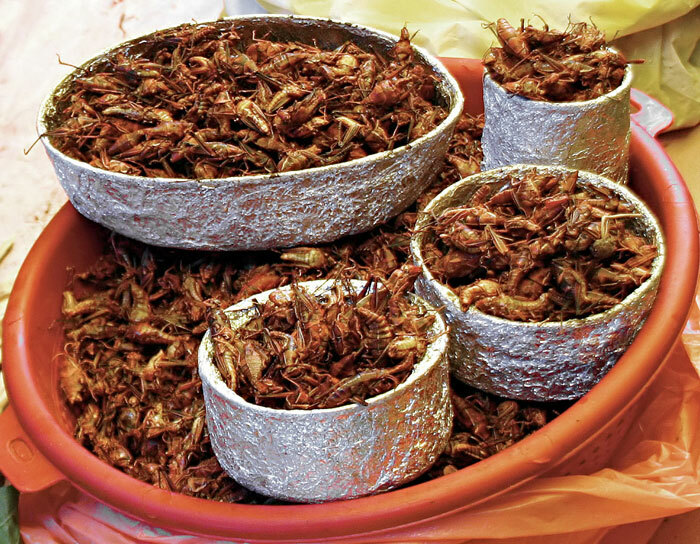 In addition to their symbolic and historical importance, the Aztec also ate grasshoppers, cooking them on clay cooking surfaces with lots of spices. (We can still see this practice today in Mexico, particularly in the state of Oaxaca where carts selling chapulines fill the streets.) 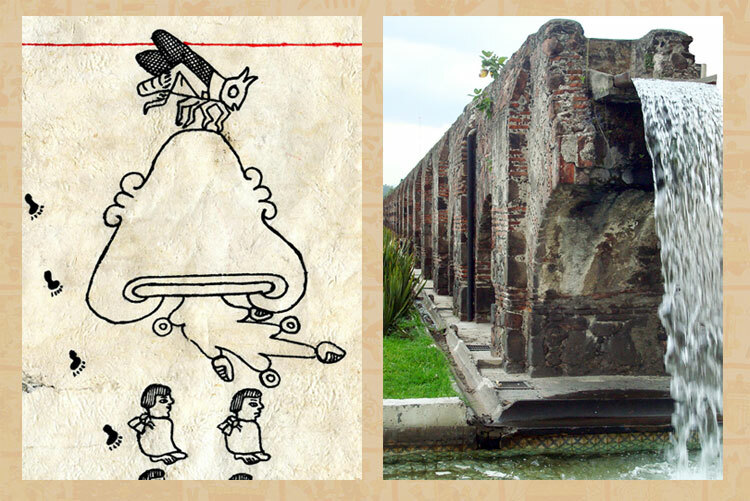 This fascinated early colonial chroniclers, as did the fact that many regions sent the insects as tribute items to Tenochtitlan. 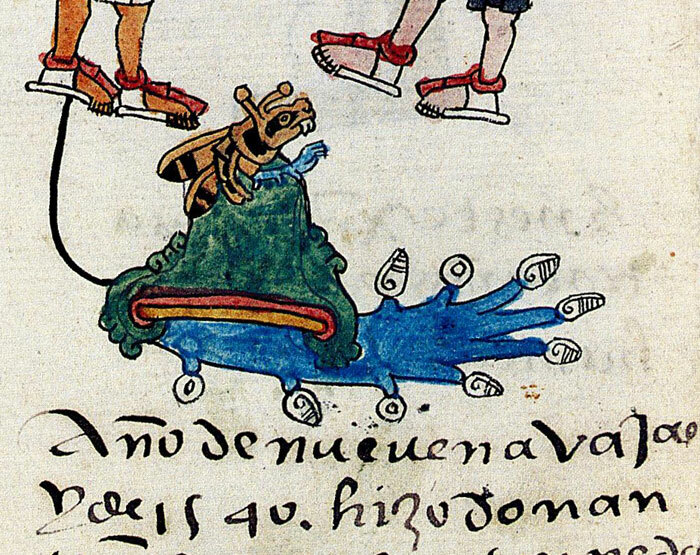 Like most plants and animals in the Aztec world, grasshoppers had a negative side, too. And, unlike many plants and animals, this negative side wasn’t just symbolic. Grasshoppers really could change overnight. When, under specific conditions, grasshoppers became gregarious and swarmed, they transformed into locusts and destroy crops in the region. For an agricultural people dependent on crops to feed a large urban population, swarms often lead to malnutrition, famine, and death. 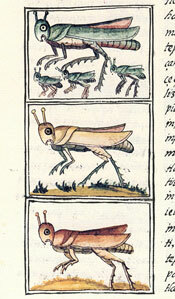 We see evidence in documents that cite the locust plagues in the years preceding 1554. 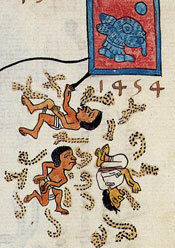 Locusts destroyed Aztec crops, causing nearly natural disaster, and it too many years to recover. 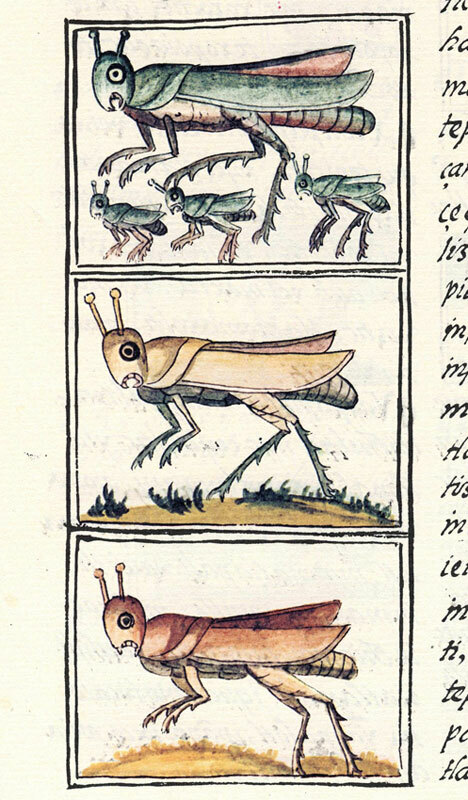 The ability of the grasshopper to change overnight highlights both the capricious nature of the gods, particularly those associated with agricultural abundance, and the importance of the dual nature of animals in the Aztec worldview. The grasshopper could bring fertility and imperial success upon the Aztec, but the locust could only wreak destruction on the empire. These were, essentially, two sides of the same coin, two forms of the same insect, one with a devastating impact and the other with abundant offerings. • Pic 6: image from the Florentine Codex scanned from our own copy of the Club Internacional del Libro facsimile edition, Madrid, 1994. Grasshoppers are tasty. If you love spicy peanuts, you’ll love grasshoppers.